We are delighted to have a short exhibition in the gallery of new works by Robert MacMillan. Robert MacMillan studied at Duncan of Jordanstone College of Art, Dundee, gaining a BA (Hons) Fine Art in 1997. He then returned to complete an MDes (2005-2006). 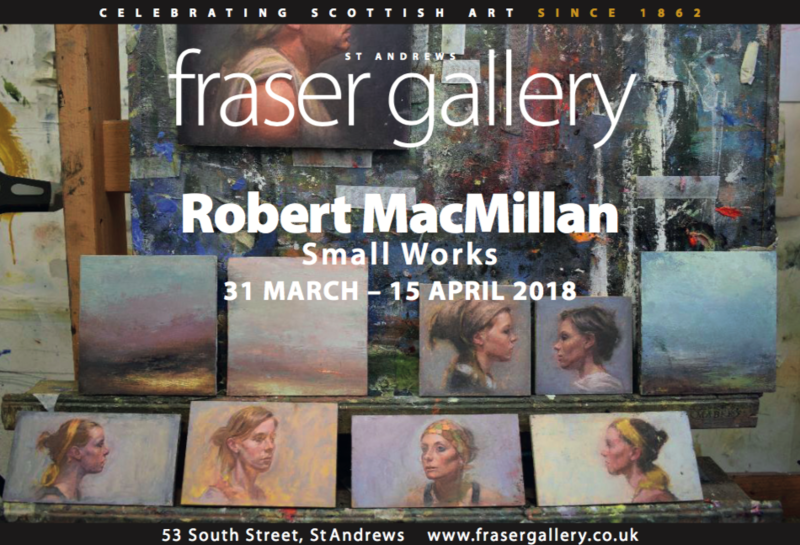 Over recent years, Robert MacMillan has undeniably developed a strong reputation as one of Scotland’s foremost figurative painters. Through consistently reconciling traditional working methods with an attitude of painterly experimentation, Robert’s work is charged with an emotional intensity. Demonstrating meticulous technique, he applies layer upon layer of paint to create depth and luminosity. Much admired by many other artists and collectors for his technical mastery, his work is greatly influenced by the old masters. The results, at first glance, are simple and uncluttered, but upon closer inspection the detail is captivating. Indeed, his work has been likened to a well crafted piece of poetry, where the omission of even a single word would alter the impact irrevocably. His paintings, although beautifully structured, are still viewed by the artist as open experiments; colour and form changing quickly as the work develops. The constant scraping, scratching, sanding and scumbling of the paint produces a finished painting with the visible and tactile history of its creation on the surface. The figurative works often focus on a single female form. This closely observed figure is sometimes covered in a golden drape with a void of an incredible rich, deep, dark negative space around the figure which has the remarkable effect of illuminating the central form as well as isolating it. Having developed a growing reputation for his figurative work which was recognised by the prestigious Aspect Prize in 2007, this new body of work sees the artist push the boundaries even further and will, we are sure, win Robert an even wider circle of admirers. Haunting landscapes, which extend and enhance his range of imagery, have been added to this collection and serve to confirm his ability to capture atmosphere and mood as subtly and as tellingly as his figurative work. His influences include the little-known Tonalists and in particular, American painter George Inness whom he regards as significant, and Whistler, whose apparently simplistic painting technique also manages to express tremendous depth and emotion. MacMillan incorporates their methods of memorising a landscape to capture its essence, taking elements of a scene and rearranging them to portray the elusive, emotional, ethereal quality of what he is seeing.